Left to Right: Darryl Spitzer, State Representative Tiffany Mitchell, Christian Mata, Agustin Garcia, and Betsy McMahon, TBCC Board of Education member. 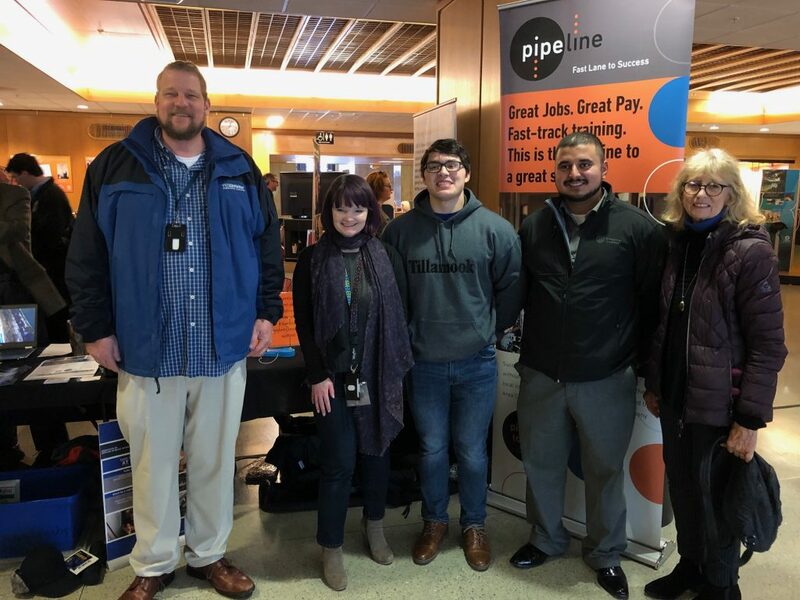 February is National Career Technical Education (CTE) Month and on Feb. 1, as part of a collective effort by community colleges in Oregon, Tillamook Bay Community College (TBCC) participated in CTE Day at the State Capitol. Darryl Spitzer, Manufacturing and Industrial Technology/Apprenticeship Program Coordinator for TBCC brought students Christian Mata, a Tillamook County Creamery Association employee, and Agustin Garcia, an employee at Hampton Affiliates, both enrolled as apprentices in the electrical and millwright programs offered through TBCC, to meet with legislators and showcase the value of Career Technical Education in Tillamook County. “In rural communities like ours, CTE programs and apprentice programs are a way for business and industry to gain skilled labor,” Spitzer said. “Community colleges provide the training needed for local employers to develop up, and essentially “grow their own” technically trained employees,” he said. At the Capitol, the trio met with legislators and visitors to talk about TBCC’s Manufacturing and Industrial Technology program that offers not only an applied science degree but a manufacturing technician certificate with emphasis areas in: welding, machining, millwright and electrical. In addition, the program carries the Certified Production Technician Certificate. Students who successfully complete this certificate will also earn national certification through the Manufacturing Skills and Standards Council (MSSC). MSSC certification establishes the student’s competence in Safety, Quality, Continuous Improvement, Manufacturing Processes & Production, and Maintenance Awareness. “TBCC’s goal is to listen to, and meet the needs of local businesses, finding ways to fill labor gaps through program development,” Spitzer said. “TBCC is lucky to have strong collaborative partnerships with both the Tillamook and Neah Kah Nie School districts with programs like welding where students can start learning skills in high school and earn college credit. We are going to be able to graduate skilled welders who also have a broad knowledge in other mechanics and industrial work that will position them for high paying jobs in our community,” he said. To learn more about the MIT program or other career technical programs at TBCC visit tillamookbaycc.edu. Spring term registration opens Feb. 25.